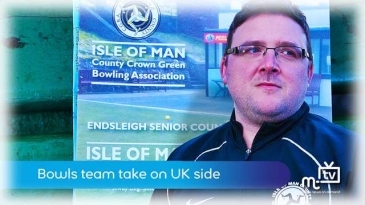 It is hold to contain my excitement and pride in the week leading up to the most important bowls match in the history of the Isle of Man. A lot of hard work has been put in by a lot of people to make this dream a reality, and it is the culmination of all of these efforts that sees the Isle of Man take on Shropshire in the Crosfield Cup. On Sunday 3rd May at 12:30 the first historic bowls will be sent simultaneously both Peel Sunset Bowling Club and Sinclair Bowling Club in Telford, Shropshire, as the Manx team aim to cause a few upsets and give their much more experienced rivals more than they bargained for. In truth the step up to full county level, the highest level of Crown Green Bowls that there is, will be a tricky one and nobody is underestimating how mammoth the task is that lies ahead, but there is a buzz around the local bowls scene at the moment and maybe just maybe we can have our own minor victories. The Island are drawn in a group with Shropshire, Lancashire and Staffordshire. Shropshire are not just odds on favourites to win the group but they are also one of the most fancied teams to win the whole competition so a good performance in the home leg is vital if the Manx men are to have any chance of causing a massive upset. Shropshire have some of the biggest names in the game in their ranks and Callum Wraight and Richie Goddard are just two that followers of the bowls festival will regognise. The travelling Manxies will have their work cut out as they travel to a green that none of them have ever even seen before and it will be a massive achievement to leave the green with some individual wins under their belts. All that is left to do is to wish all of the players and everyone involved the best of luck and it would be brilliant if as many of you that can make the pilgrimage to Peel at 12:30 on Sunday to offer your support as the Island’s best bowlers embark on a new adventure. Whilst a win would be unbelievable the most amazing achievement has been to make it to this point, and anything else beyond will be a huge bonus. Bowls is back! If the first few entertaining weeks fixtures were the appetisers last Monday’s gargantuan war of attrition between South Ramsey A and Marown A was most definitely the main course, and after such a delight it leaves me wondering what truly spectacular mouth watering dish will be served for dessert. 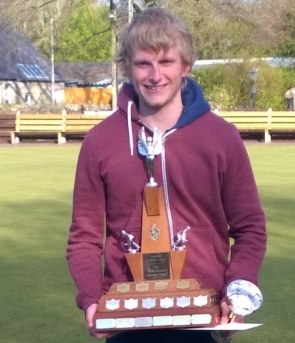 It is very rare in an eight aside bowls match for the entire fate of the game to rest on the solitary figure standing on the mat, lying game down, with the final bowl of a 296 point affair in his hand, but last Monday it happened. They say cometh the hour cometh the man and Dido Kelly was more than ready to prove the old adage true as at 20-19 ahead he found himself lying two down after a brilliant fight back from a very worthy adversary, five times Island Champion Colin Kelly. As things stood if Dido failed to change things Colin would seal a well earned 6-4 win for the visitors, but Dido never knows when he is beaten. With one of the best bowls you will ever see full corners he trailed the jack to his back bowl to win his game, tying the match on aggregate and ensuring it was his side who were on the right end of a well fought 6-4 victory. Oblivious of events up north league champions Onchan A ruthlessly went about their task of defending their title with a 10-0 dismantling of Castletown B. Winning big at home is the key to any victorious championship quest and with both of their openers at the park ending in maximum victories where they concede on average 71 points against they have definitely thrown the gauntlet down to the challengers. Both Marown and South have the pedigree to beat Onchan in head to heads but it is the champions devastating consistency which could be the key to their success. Douglas A followed up last week’s hard earned draw with South Ramsey with an extremely impressive 9-1 away victory over Castletown A to leapfrog the men from the crofts into third place. At the top of division two it was first against second as league leaders South Ramsey B travelled to the Villa Marina to take on an inform Douglas B side. Despite young Stefan Kelly’s performance of the night for the visitors, beating Roy Williams 12-5, it was the home side who took victory with an extremely impressive overall team performance seeing them come away with a comfortable 8-2 win. They will be tough to beat this season if they keep this form going and now top the table with the visitor’s four points behind in second place. Port St Mary B had to fight at home to overcome a spirited Onchan B side 6-4 and now find themselves in third spot. With Peel C, Ballaugh C and Douglas C all picking up good 7-3 home victories its very tight at the top of division three with them on 22, 22 and 21 points respectively from the first three games. League Champions Onchan A continue to head Isle of Man Bank Mens Division One thanks to a 9-1 win away at Port Erin A. They will be disappointed not to have picked up all ten points after a very strong start to the season. Second placed South Ramsey A’s run of maximum 10-0 victories also came to an end as they met a battling Douglas A side at the Villa Marina, with honours ending even 5-5. The home side won 5 out of the 8 games with the visitors aggregate score enough to seal the draw. Castletown A are still flying high in third place after a very strong 9-1 win over their B team at the crofts. Marown A have played one less game than their rivals and got their campaign going again with a 9-1 win over Ballaugh at the memorial playing fields, just missing out on the maximum by a solitary chalk as Captain John Keenan winning 21-20 against Dean Kipling to get his side on the board. The two newly promoted teams faced off at Finch Hill with the home side running out 7-3 victors over NoblesPark to get some much needed points on the board. North Ramsey A are an ever improving side who can be a test for anyone and they will be happy with a 7-3 victory on their travels to Peel A. South Ramsey B top division 2 thanks to a 9-1 home win over a struggling Castletown C side, with John Kinley’s victory the only light at the end of a very long tunnel for the visitors. Douglas B continue their strong start to the season with an 8-2 win away at Ballaugh B.
Peel B are in third spot despite losing out on their travels to Onchan B who managed a 6-4 victory. Onchan C top the division three tree thanks to and 8-2 home win over Peel D in a league where I think the lead will change hands all the way to the wire. Roundup of the three opens contested this weekend. 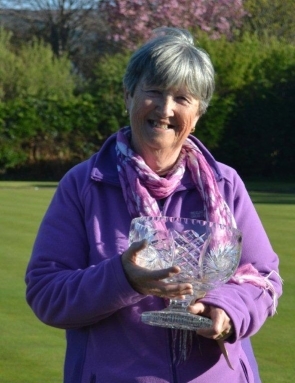 On Saturday in the ladies singles at Ballaugh Margaret Tasker came through a tough field to win the Pearl Kaighin beating Philippa Fletcher 21-9 in the final. In the Mens Singles at Marown Rob Monk won his maiden singles open beating Ian Moore 21-10 to clinch the Henry Kissack Memorial Trophy. 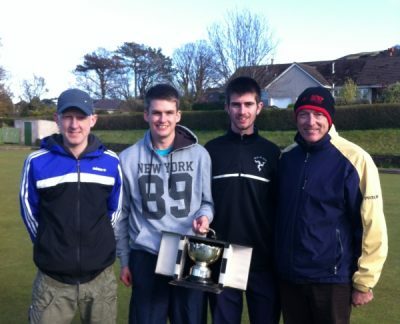 On Sunday 12 teams took part in the Jim Kernan. Each team consisted of four players two playing singles and the others competing in a doubles with the winner of each match decided on total chalks. The final turned out to be an all Onchan affair with David Bradford beating Glynn Hargraves 21-13. Jordan Cain beating Matthew Quirk 21-17 and Matthew Keggen & Peter Slinger beating Phil Kerruish & Kevin Quirk 21-11 meaning an overall victory of 63-41 for Cain, Bradford, Keggen and Slinger. There was a good entry of 32 for the Pearl Kaighin ladies’ singles played at Ballaugh on Saturday 25 April, where the sun shone but the weather stayed cold, particularly for the later stages. The green was interesting, running well but it helped to have the jack! Quarter-finals: Sylvia Kennaugh 21, Tricia Bull 14; Philippa Taylor 21, Pat Robertson 16; Lilian Slinger 21, Helen Martin 15; Margaret Tasker 21, Janet Monk 14. In the semi-finals Margaret found a mark that she played well with Lilian struggling to respond, while the other semi-final was closer with Philippa having the advantage but Sylvia did not give up easily. Semi-finals: Margaret Tasker 21, Lilian Slinger 11; Philippa Taylor 21, Sylvia Kennaugh 16. Club chairman, Jenny Maddrell, thanked those who had entered and those who had stayed to the end before introducing Bernard Kaighin to make the presentation, thanking him for his continued sponsorship of the competition. After the glorious weather earlier in the week conditions returned to normal to give a miserable night for the matches played in the C Tarleton Hodgson sponsored league on Friday 24 April. Their was an interesting match at Noble’s where, despite winning only three of the nine games, the home side ended with a one point advantage. Although Kath Kinley won to single figures for the visitors the rest of the home players all scored over 15 points, the game of the match being the 21-20 win by Hannah Kermode against Sylvia Kennaugh. There was also a win to single figures by Julie Macleod for the home side. Mooragh Park entertained Port St Mary taking four games with Lilian Slinger winning to single figures. In reply Ann Maddrell and Alison Keggen also won to single figures while Tricia Bull just lost out 20-21 to Kim Hargraves. South Ramsey had the top score of the night against Peel Sunset who seemed unable to get to grips with the conditions. Jenny and Elaine Moore both won to single figures while Joyce Kelly was the lone winner for the visitors. Mary Moffatt came from behind to reach 20 against Shelley Kennish while Philippa Taylor scored 19 against Fiona Kennish. Ballaugh had a 6-3 win against Onchan , Jo Smith winning to single figures for the home side as did Peggy Griffin for the visitors, while Purt le Moirrey won on chalks, despite losing 4-5 on games, with three of their players winning to single figures as did Paula Garrett for the visitors. Marown had the better of Port Erin 5-4 on games with Mary Alderson and Pat Withers winning to single figures as did Sylvia Shelbourne for the Port Erin. The preliminary round of the Jean Kelly team handicap knock-out competition was held in glorious weather on Wednesday 22 April. The holders, Peel Sunset,. travelled to Port St Mary where, despite their 20 point handicap advantage, their defence of the trophy ended. On a fast green Port St Mary won six games, four of them to single figures, while the visitors could only manage three, although Joyce Kelly also won to single figures. Port Erin played host to Noble’s who were in rampant form, winning 7-2 on games with Sonja Lees winning to single figures. The two winners for the home side were Kay Primrose-Smith and Mavis Franks who also won to single figures. Further resistance came from Voirrey Curphey, who reached 17 against Clare Cooper and Lynda Cadamy who scored 18 against Rebecca Teare. South Ramsey travelled to Marown where they won six games with Fiona Kennish and Gill Dixon winning to single figures. Despite wins by Pat Withers, Margaret Scarffe and Mary Alderson for the home side together with a 30 point advantage on handicap, the Crosby girls had to concede defeat to South Ramsey albeit by the narrowest margin of the night. The quarter-finals take place on Thursday 14 May. Click here to see the fixtures. The sun shone for the matches in the Trend sponsored ladies’ over 60’s league on Tuesday 21 April, adding to the enjoyment of the competition. Only two of the matches were drawn on games. Noble’s were level with Castletown, but came close to a 4-2 lead as Sylvia Kennaugh lost out 20-21 to Sue Peach and had a clear win on points. Unfortunately Douglas were a player short and did well to win three games although they ended with a points deficit. Top scorers of the day were Onchan A at Mooragh Park having a 4-2 advantage on games with Hazel Hughes and Maureen Payne winning to single figures. The two winners for the home side were Maureen Wright and Mary Kinrade. Mavis Franks prevented a white-wash for Port Erin as she won her game against Port St Mary, Jacqui Elliott also did well to reach 19 against Wendy Kennaugh but it was not enough to prevent Port St Mary recording the second highest score of the morning. Marown entertained Breagle and had a comfortable 4-2 win with Shirley Whelan and Mary Alderson winning to single figures, and it was a similar tale at Port St Mary B for whom Edwina Reid and Sandi Lowe won to single figures. Peel Sunset travelled to Onchan B where they won four games, three of them to single figures, but Wendy McDowell and Lesley Nicholl, who also won to single figures, fought back for the home side.